On Wednesday, April 9th, Jazz Choreography Enterprises sponsored a free advanced beginner jazz dance workshop. It was produced in conjunction with the New York Jazz Choreography Project performances held on April 12th and 13th. 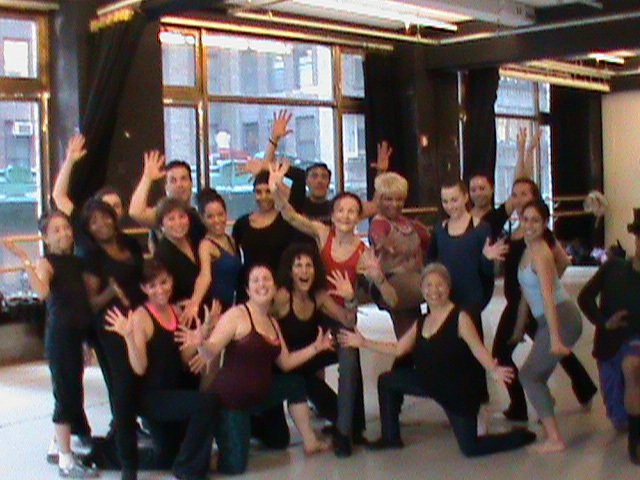 Sue Samuels, a veteran of the jazz dance scene and Artistic Director of Jazz Roots Dance Company, taught the class. Samuels’ class showed how jazz dance incorporates many diverse styles and influences. Her warm-up routine used barre exercises, which is more common in ballet. She also pointed out other influences throughout the class, such as movements from jazz choreographers like Jo Jo Smith, Matt Mattox, and Luigi. She even pointed out a step that was inspired by the modern dance legend Martha Graham. Samuels kept the class light and tried to encourage humor among her students. She also emphasized performing as part of dance, saying that it was the dancer’s responsibility to bring the movements to life. The class was held at DANY Studios in midtown Manhattan, and it was free to attend. Eighteen dancers participated, and they had some great words of praise following the class. After the class, I was able to send Samuels a few questions about her teaching style and her thoughts on jazz dance. How would you describe your jazz style? What are the characteristics? Who were your major dance influences? Aside from dance technique, what would you like your students to learn from you? Why do you use a barre warm-up when most jazz teachers use floor warm-ups? How do you think it better prepares the students for your class? Do you have a different approach when teaching your students a combination as opposed to teaching members of your company one of your routines for a performance? What is the one thing you would want a new student to take away from your class? As a veteran teacher, how have you seen jazz and dancers’ approach to it evolve over the years? JCE is working to give instructors like Samuels the opportunity to teach other classes and is hoping to be able to offer more workshops in the future. Miriam Bernabei, another student who attended the class, was enthusiastic about Samuels’ class and the opportunity JCE provided for her to take it.